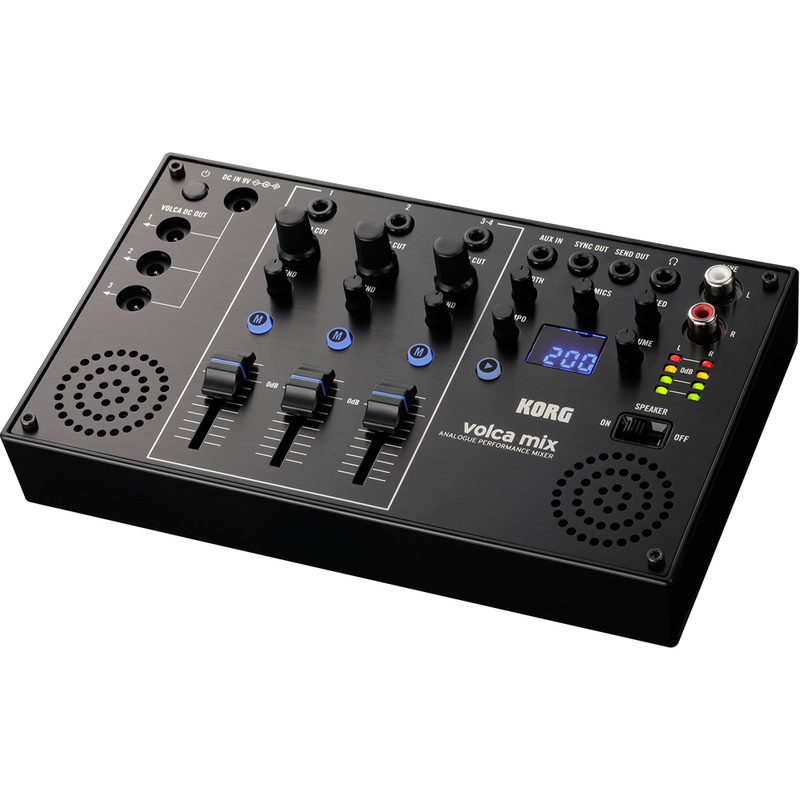 An analogue performance mixer that completes your Korg Volca setup. Volca mix is the long-awaited mixer for the volca series. The volca mix is a four-channel analogue performance mixer that lets you construct a live setup combining multiple volca units. Volume faders are easy to control, plus crisp-sounding LO/HI CUT filters, and a master chain that radically transforms the sound. In addition to the sync function found on all volcas, there are also DC output connectors that can supply power for up to three volca units. Numerous functions to facilitate your on-stage volca performances have been packed into a high-quality aluminum-paneled body, reminiscent of a high-end DJ mixer. The volca mix will unlock the maximum potential of the volca series. An analogue performance mixer that completes your volca setup. Volca mix is the long-awaited mixer for the volca series. The volca mix is a four-channel analogue performance mixer that lets you construct a live setup combining multiple volca units. Volume faders are easy to control, plus crisp-sounding LO/HI CUT filters, and a master chain that radically transforms the sound. In addition to the sync function found on all volcas, there are also DC output connectors that can supply power for up to three volca units. Numerous functions to facilitate your on-stage volca performances have been packed into a high-quality aluminum-paneled body, reminiscent of a high-end DJ mixer. The volca mix will unlock the maximum potential of the volca series. The volca mix is equipped with master effects powered by all-analog circuitry. In addition to an expander that broadens a mono source into a stereo sound image, there’s a dynamic range compressor that compresses the high-frequency range according to level changes of the low-frequency region, as well as a side chain effect that’s indispensable for dance music. Use these to dynamically vary the mix, adding a professional feel to live performances with the volca. Connect an external effect unit for further variety. The volca mix provides a stereo mini-jack send out and AUX in jack, and send level knobs for each channel. This allows you to use it with an external effect unit in a send/return connection. When used in conjunction with a unit such as the mini kaoss pad 2S, you can also enhance your live performances using standard effects such as reverb, delay, filter, and break. The AUX in jack can also be used as a stereo input channel for a fourth volca unit, an iOS app, or any other gadget, instrument, or device. As the master of your volca live setup. 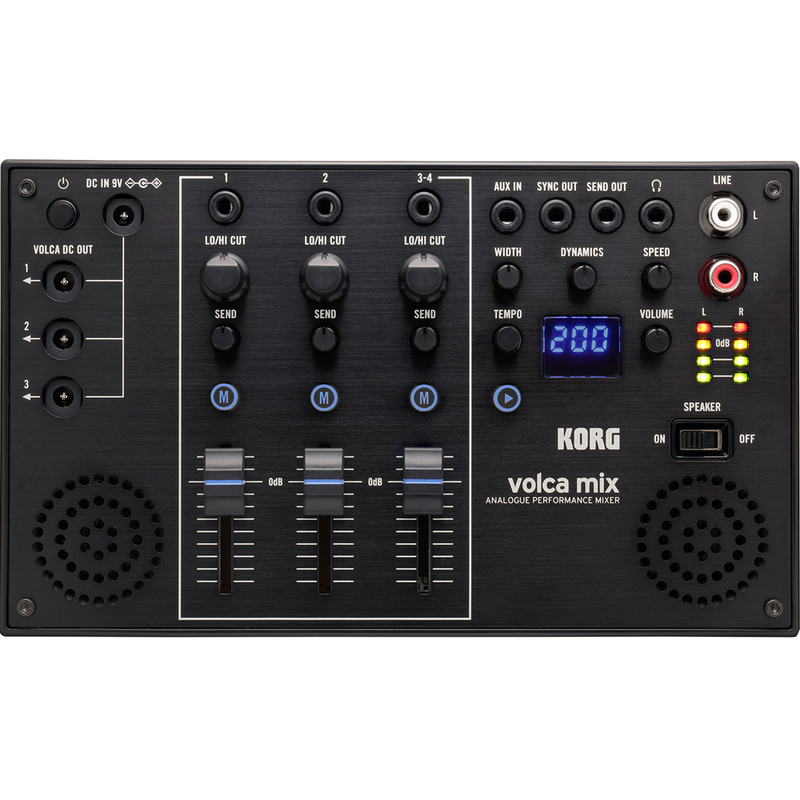 The volca mix features an analog sync out jack that can easily be connected to many pieces of KORG gear for tempo sync, and also a play button and tempo knob to control that sync signal. By using the volca mix as the sync master device of your live setup, you can easily enhance your live performance, such as simultaneously playing sequences from multiple synced units, and combining mute and volume control to create performances that use your volca units in even more ingenious ways. DC out lets you use three volca units simultaneously. Three VOLCA DC OUT jacks are provided, and by connecting the included DC-DC cables you can supply power for up to three volca units. Even when using multiple volca units on stage, you won’t need to bother with adapters or bring another power strip; just concentrate on your performance with a streamlined setup and breakdown. A rich variety of included accessories. The volca mix comes with AC adapter, DC-DC cables, and audio cables included. Right out of the box, you’ll be ready to put together a complete volca live setup.